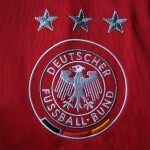 Coaches: Rudi Völler, Jürgen Klinsmann. 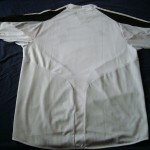 The home shirt used for the 2004 European Championship finals was another decent effort – white with black and a smattering of Rot-Gold on the sleeves. 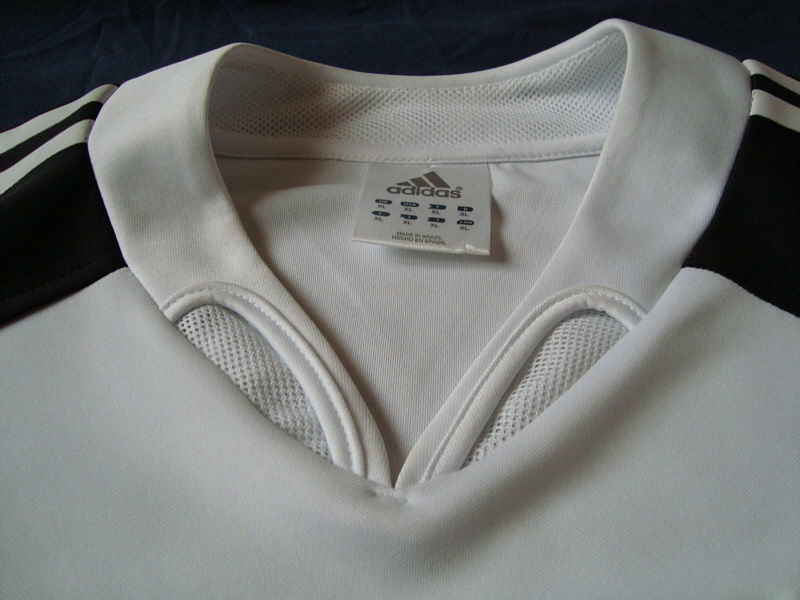 The shirt itself was a multi-piece construction, with different materials being used to maximise comfort on the field; while the top half of the shirt was made of a more standard white fabric, the lower parts and side panels were a very fine mesh – part of Adidas’ new “Climacool” concept. 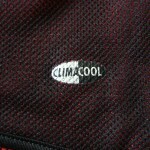 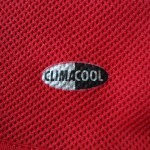 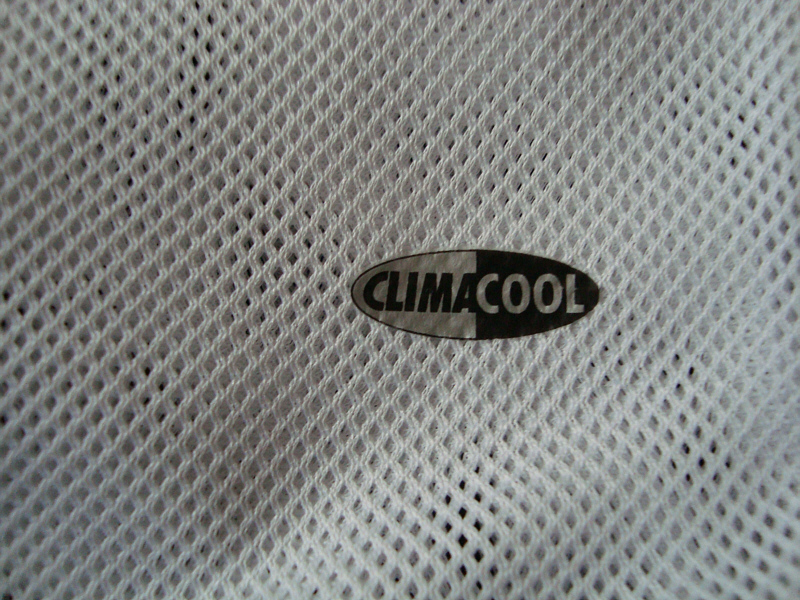 The shirt had a white v-neck, with two small panels in the new “Climacool” mesh. 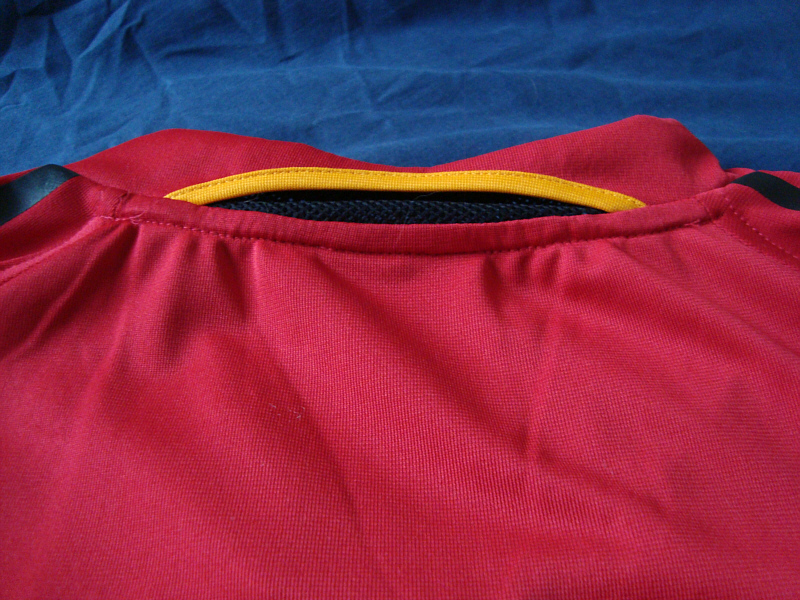 The 2003-2005 white shirt saw a little more Schwarz-Rot-Gold than the more classical design that had preceded it, but the use of colour was both subtle and stylish – restricted to two small triangular red and gold sections at the front under the arms. 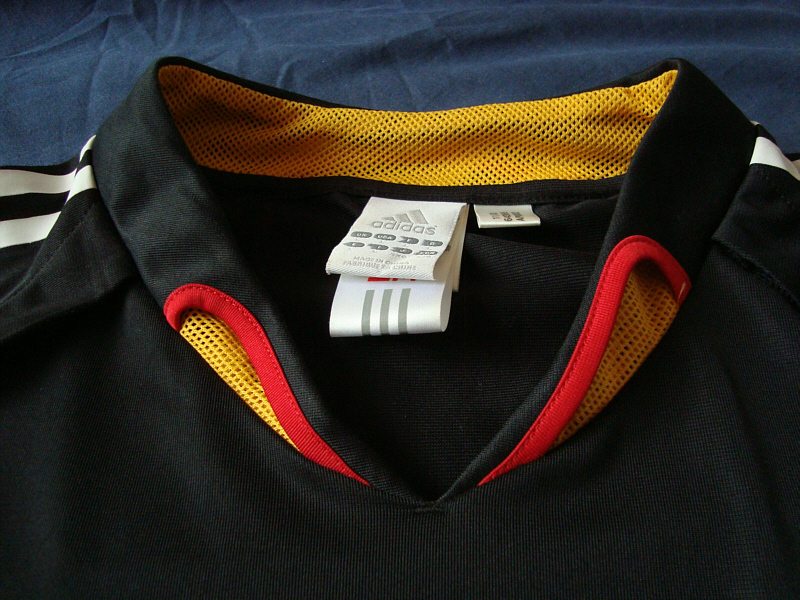 The shoulders were black, and adorned with the three Adidas stripes that tapered into points rather than extending all the way to the end of the sleeve. 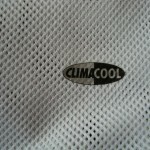 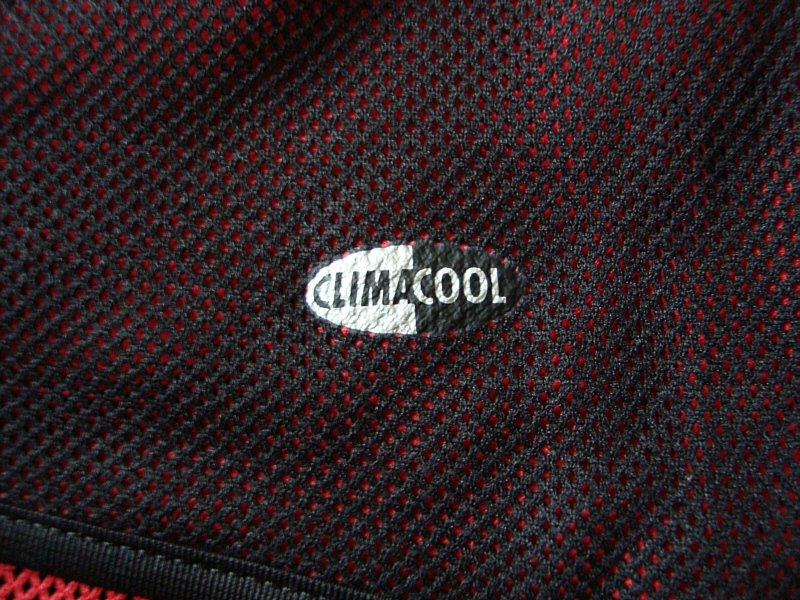 Stitched onto the top of the left sleeve (the right as you look at the shirt from the front) was a small national flag with a white/silver border; a small “Climacool” logo was ironed onto the bottom of the garment. 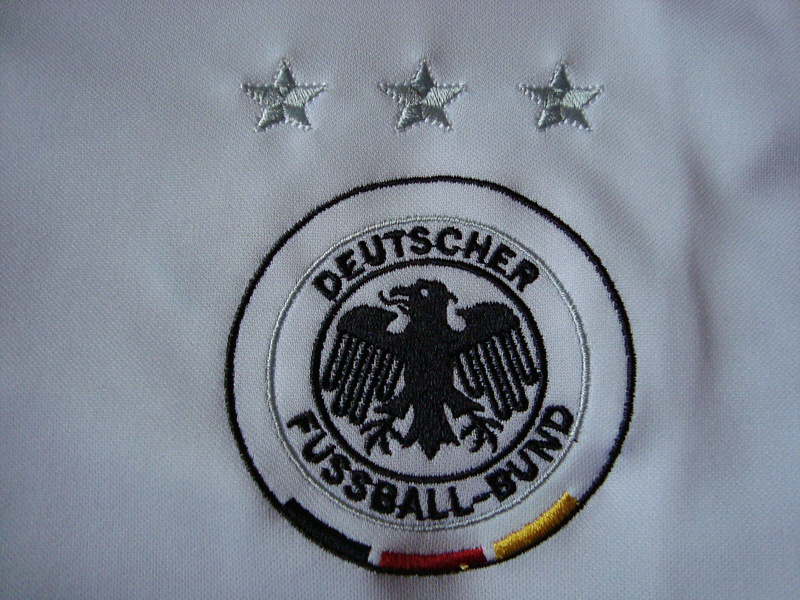 A significant change was the appearance of the national eagle: the crest was more or less the same size as before, but a third outer circle was added with the national colours at the base. 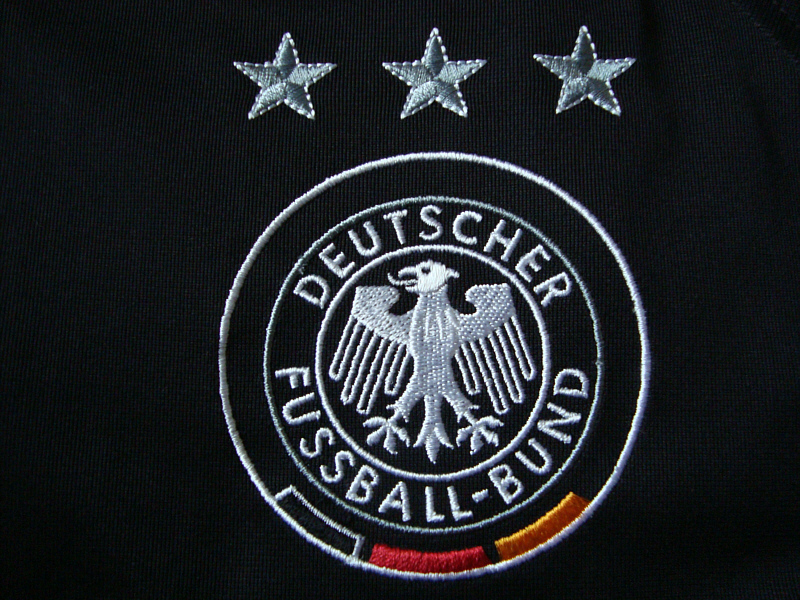 The eagle itself – like the Adidas logo woven in black thread – was made slightly smaller and placed inside a black circle, while the legend “Deutscher Fussball-Bund” was now enclosed by a circle woven in grey/silver thread. 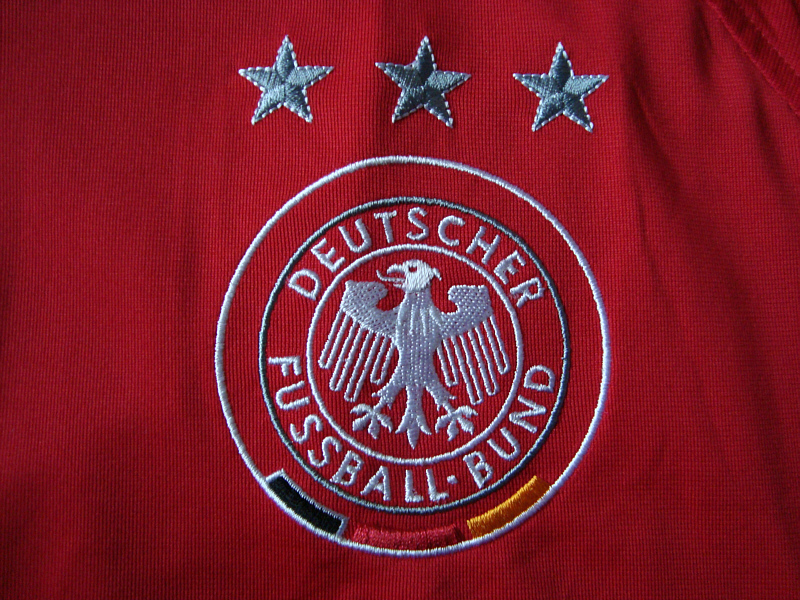 Above the national crest were the three championship stars, all of which were now in stitched in silver thread rather than Schwarz-Rot-Gold as had been the case since their first appearance in 1996; the stars were now themselves part of the national crest, as they appeared above the national eagle on all official clothing and kit. 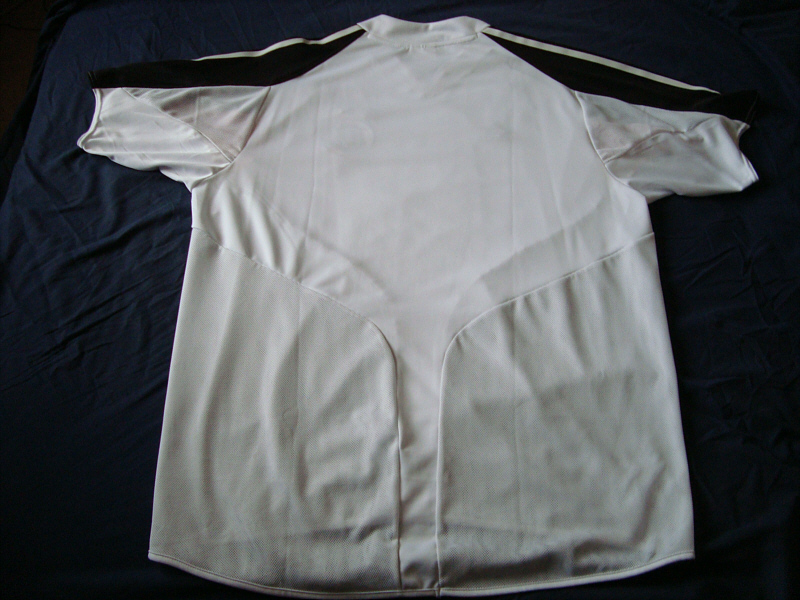 The white home shirt was of course complemented by black shorts, which had a small touch of Rot-Gold at the base of the left leg and the three trademark Adidas stripes in white which tapered to a point like on the shirt. 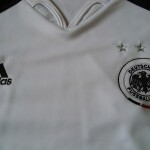 In line with the championship stars being incorporated into the logo, the national eagle, three championship stars and the Adidas logo were all woven in white/silver thread on the left leg. 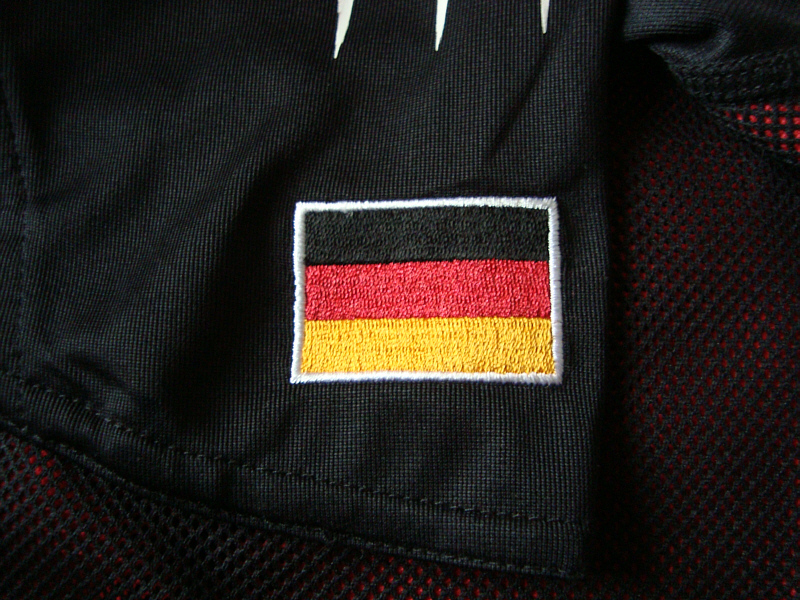 As with the previous Nationaltrikot, the socks were plain white, but with a small national flag at the front and the Adidas logo in black at the back. 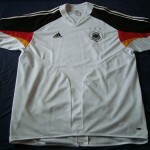 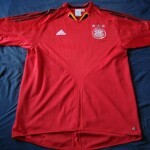 Although the Euro 2004 campaign ultimately ended in disappointment, probably the most memorable moment for this shirt was the strike by Michael Ballack that gave the Nationalmannschaft a short-term lead against the Czech Republic in their final first phase group match – closely followed by Ballack’s winning free-kick against Mexico in the FIFA Conderations Cup in 2005. 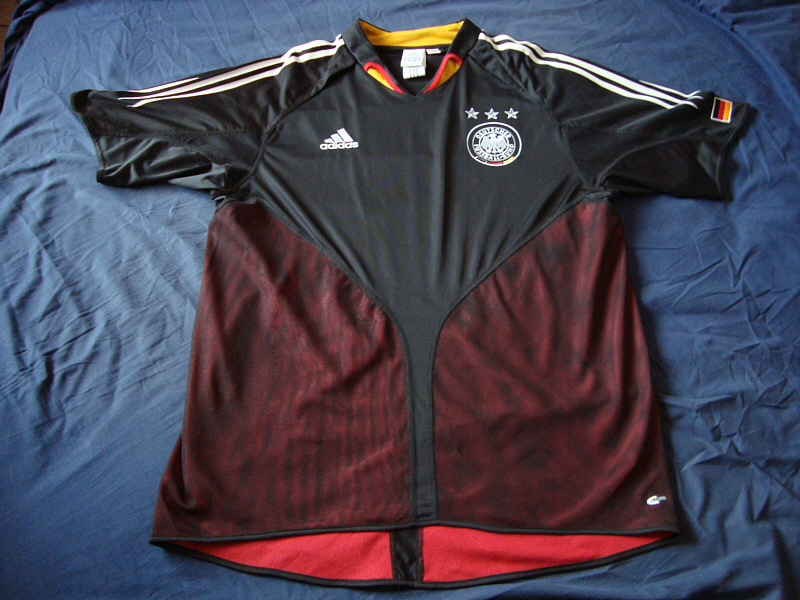 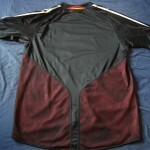 Two different second “away” shirts were worn by the Nationalmannschaft during this two-year period; the first was a smart black design with white trim, and the second a more aggressive-looking red with white trim. 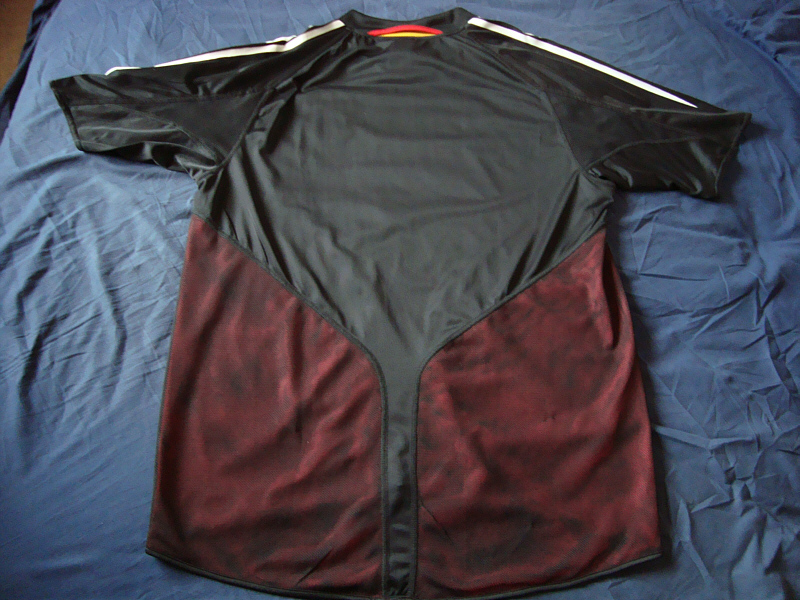 The black shirt had the same basic design as the white one; the top half was made of standard black fabric, while the sides and lower parts consisted of two separate layers – a dark red underlay and black “Climacool” mesh that gave the garment an almost burgundy colour. 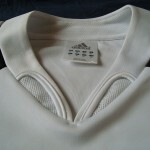 The shoulders were adorned with the three trademark Adidas Streifen in white, which were identical to those on the white home shirt; on the left sleeve was the woven national flag with a white/silver border. 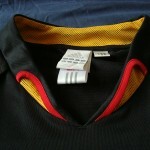 The front of the black v-necked collar had two small panels in gold mesh material piped in red fabric, with there being a third similar panel on the back – a feature that was not on the white version. 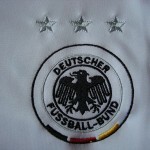 Both the Adidas logo and the new version of the national eagle and three championship stars were woven onto the garment in white/silver thread, with the second circle surrounding the “Deutscher Fussball-Bund” woven in a darker silver/grey thread. 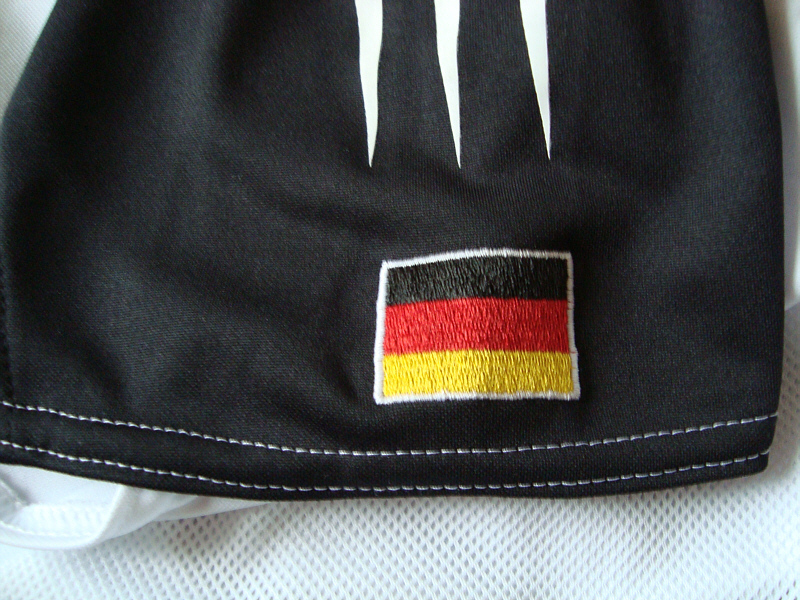 The black shirt was paired up with white shorts; the design was much the same as the black home shorts, though with tapering black stripes and the Adidas logo, national eagle and championship stars on the left leg in black. 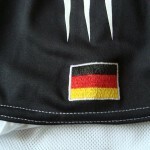 The kit was completed with plain black socks with a small national flag at the front and the Adidas logo in white at the back. 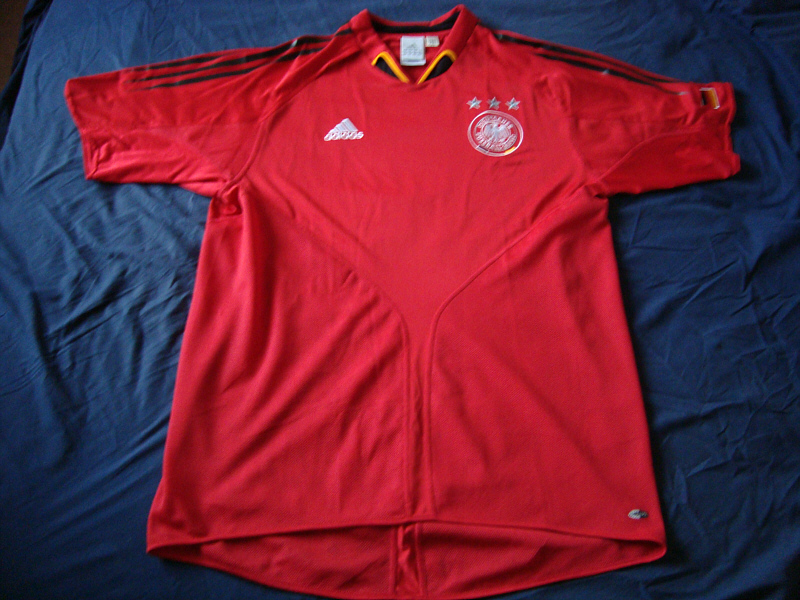 This shirt was only used once in actual match play, when Germany played Croatia in Zagreb in an early 2003 friendly – with the Mannschaft winning by the odd goal in three courtesy of a last-minute winner from defender Carsten Ramelow. 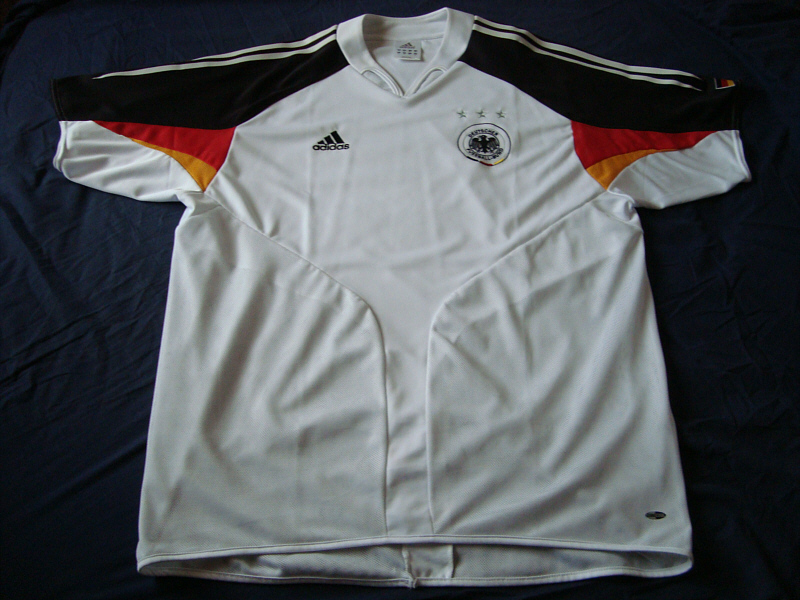 However if I were to associate one player with this shirt it would be Phillipp Lahm, who impressed on what was his first game for the national side. 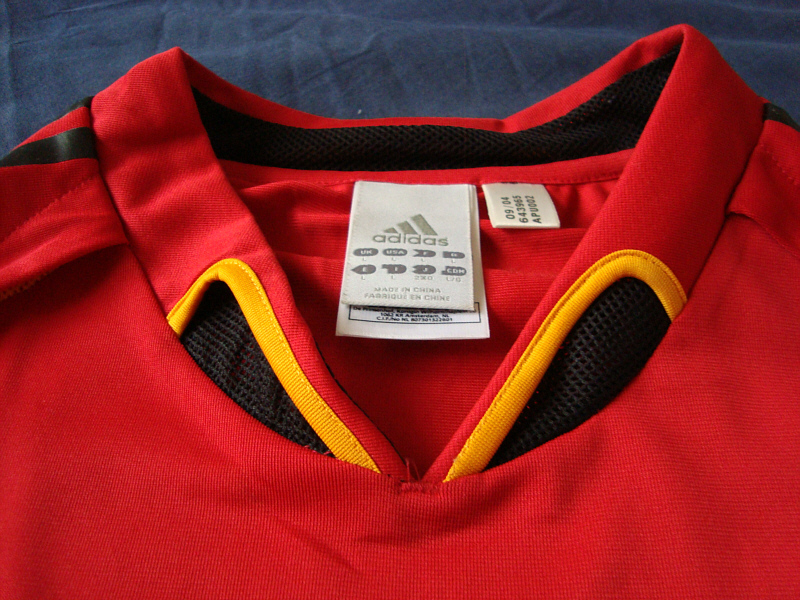 2005 saw the introduction of a third new colour in almost as many years, when a new red and white Nationaltrikot was released in time for the FIFA Confederations Cup being played on home soil. 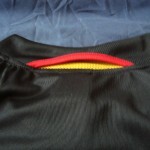 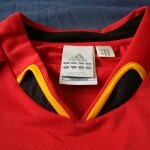 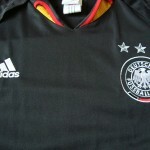 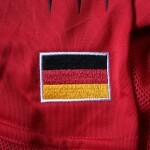 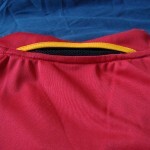 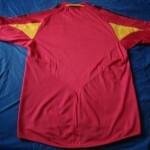 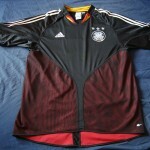 Replacing the short-lived black design, the new red shirt was introduced following coach Jürgen Klinsmann’s idea that the colour gave a team a slight psychological advantage. 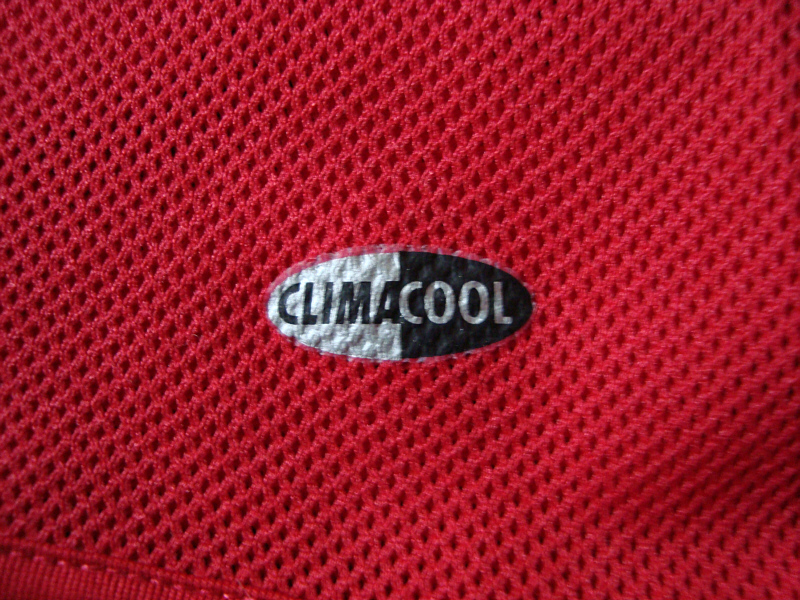 The design of the red shirt was much the same as both the white and black designs, with the top half of made of regular red fabric with the lower part and sides consisting of a red underlay and red “Climacool” mesh. 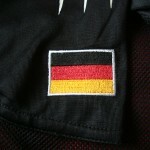 The three tapered strieps on the shoulder were in black, with the woven national flag bordered in white/silver thread on the left sleeve. 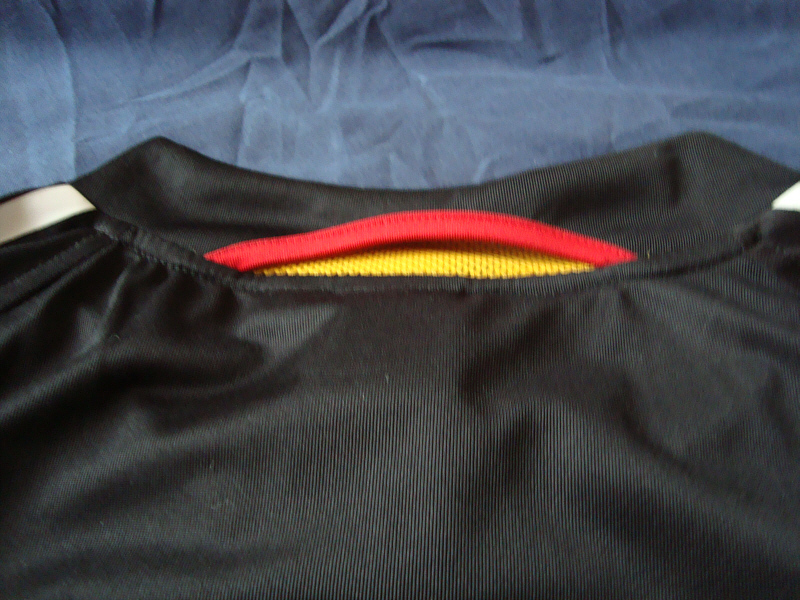 As with the black shirt, the v-necked collar on the red design featured two coloured panels on the front and one on the back – all in black mesh piped in gold. 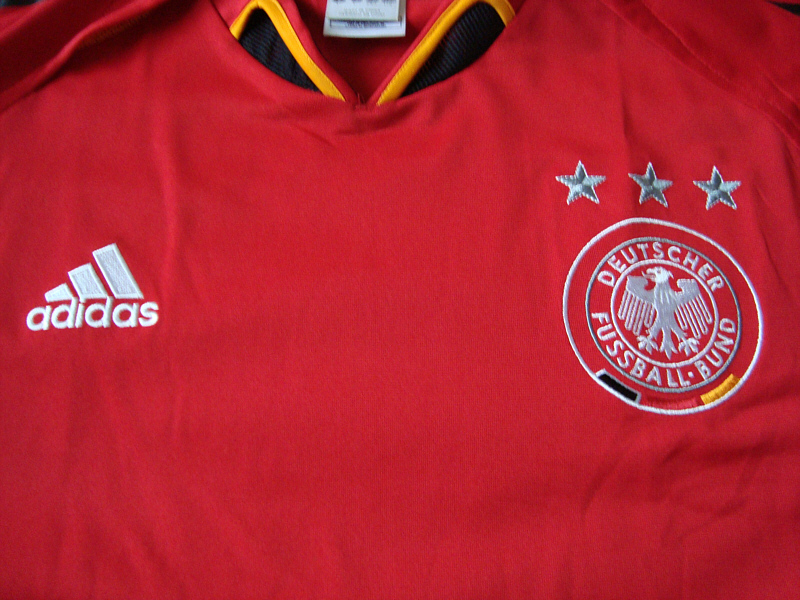 There was one small difference in that the back of the shirt also featured two small gold triangular panels under the arms, though the Adidas logo and national eagle were exactly the same as on the black shirt. 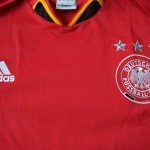 The shorts worn with the 2005 second shirt were exactly the same as those that had been issued with the black one – white with three black tapered stripes – while the socks were plain red with a small woven national flag at the front and the Adidas logo in gold at the back. 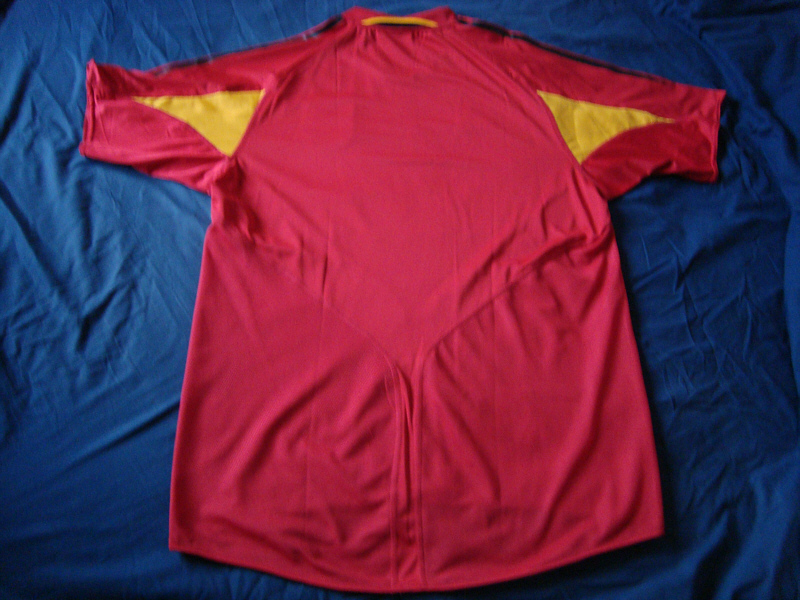 Jürgen Klinsmann’s red design featured in a number of games, including a cracker of a match in the 2005 Federations Cup semi-final against Brazil. 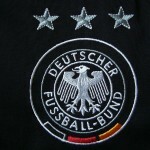 Klinsmann’s rather experimental side lost the match 3-2, but the signs were encouraging – this young German team could score goals. 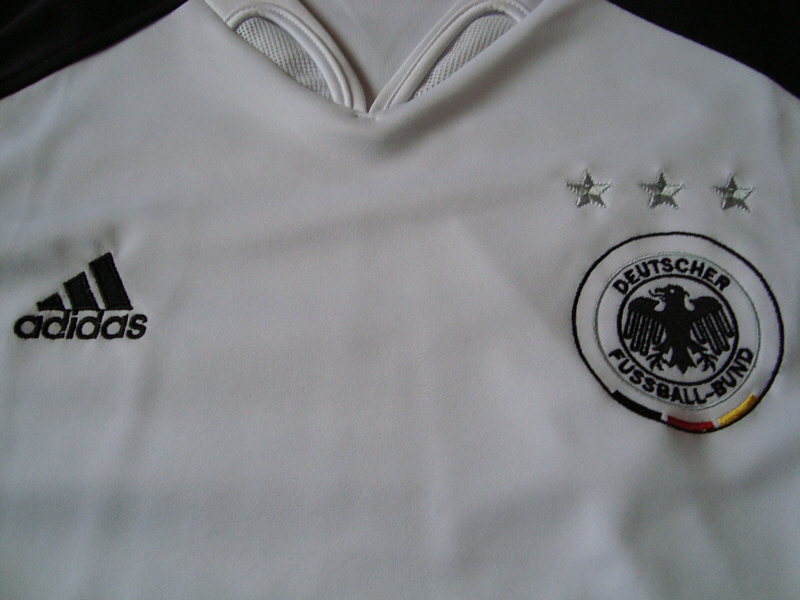 White: v France 15.11.2003, Gelsenkirchen. 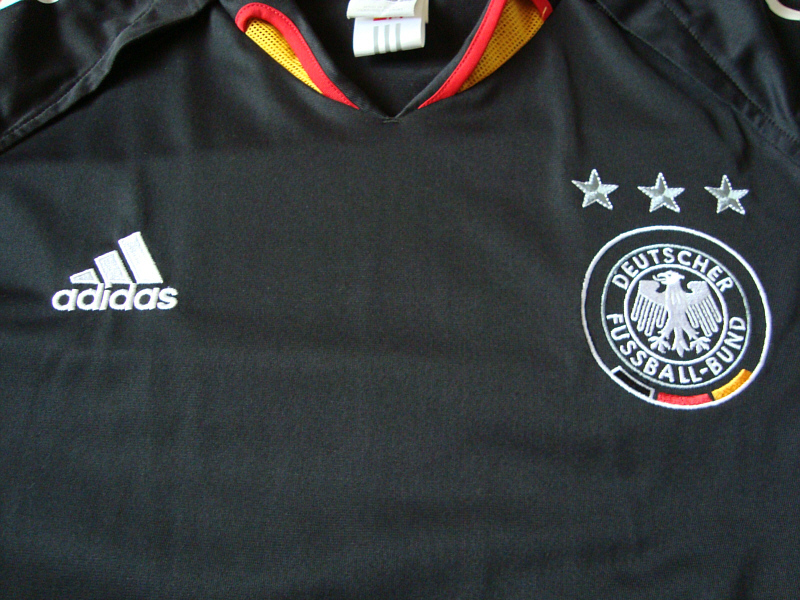 Black: v Croatia, 18.02.2004, Zagreb. 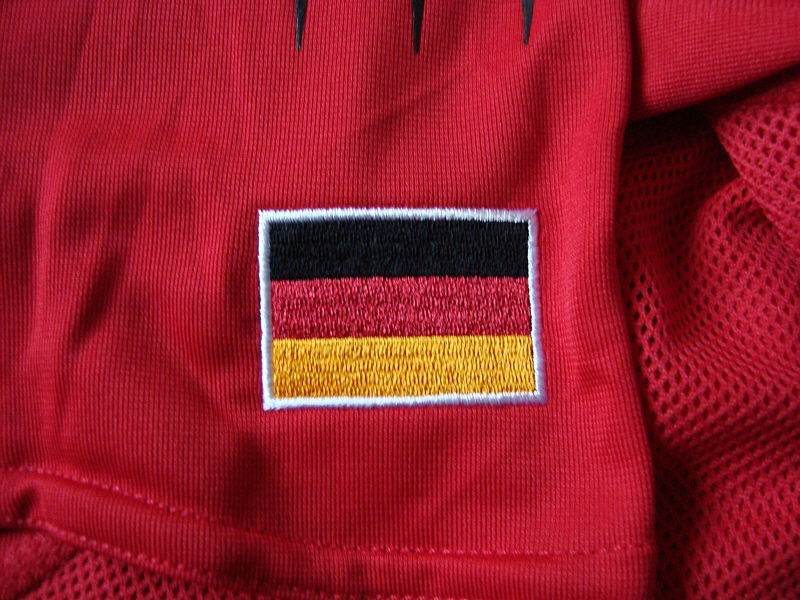 Red: v Argentina, 21.06.2005, Nürnberg.